The Lakes District, stretching from Ootsa Lake in the south to Babine Lake in the north (100 km or 62 mile radius) is situated between the Fraser and Skeena River watersheds. There are over 300 lakes providing good fishing for some of the largest rainbow trout and char in the province. These bodies of water, including Uncha and Francois Lake also offer excellent canoeing, kayaking and hiking. Access to Tweedsmuir, BC's largest Provincial Park, is from Burns Lake. As there is no road access, visitors must enter the park on foot, by water or air. Other lakes worth a visit are Francois and Ootsa Lakes. The economic stays of this community include logging, farming and tourism. The construction of the Grand Trunk Pacific Railway in 1908-14 brought settlers to this now supply centre for the Lakes District. Visit the Lakes District Museum and its logging exhibits. 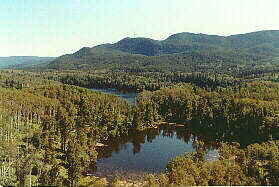 Burns Lake is located on the Yellowhead Highway 225 km (140 miles) west of Prince George. Along the way you may wish to visit the Eagle Creek Opal Deposits which are located about 3km (2 miles) from Hwy 16. The Francois Lake Ferry will take visitors across the lake to Southbank for good rainbow and lake trout fishing. Resorts and camping are readily found here. The lake is located on the northern boundary of Tweedsmuir Provincial Park, 42 km (26 miles) from the Francois Lake ferry via gravel road. West of Ootsa Lake is the Wistaria Provincial Park or return to Burns Lake and follow Highway 16 to Ethel F. Wilson Provincial Park on Pinkut Lake and Babine Lake, the longest natural lake in B.C., 36 km (22 miles) north of Burns Lake. Continuing west along the Yellowhead Highway is the Six Mile Summit with spectacular views of the mountains and valleys surrounding. Next is Topley and the Topley Landing Road (Hwy 118) which leads to Granisle. Granisle is located 50 km (30 miles) from the Topley exit on the shores of Babine Lake. Originally built to house the miners from the Copper Mountain, Granisle is now a recreational centre with nearby Babine Lake and Red Bluff Provincial Park offering camping, fishing and hiking. Resorts and accommodations are available in town. Highway 16 continues onto Houston.